You would never think that an established business like VISA had an interesting history behind it but it’s actually quite dramatic. It all started back in 1904 thanks to a second-generation Italian-American named Amadeo Pietro Giannini who was living in San Francisco. After the city was devastated by an earthquake and fire in 1906, Giannini kept his Bank of Italy going by setting up a desk in the rubble made from a couple of barrels and some wood planks. The Bank of America then emerged from the ashes thanks to a series of mergers engineered by Giannini in the 1920s. In 1958, BofA ushered in the “cashless revolution” with the BankAmericard. It was literally a piece of paper with a name, an account number, and an address typed onto the card. That revolutionary slip of paper was the world’s first “revolving credit card” where the cardholder could carry a balance from month to month and pay off the charges over time – with added interest, of course. Those first BankAmericards were issued with a $300 credit limit and to stimulate demand, Bank of America distributed thousands of unsolicited “$300 loans” to the public. People across the country signed up for the new payment method in droves not knowing how big a burden the debt could become if unaddressed …the masses were now hooked. 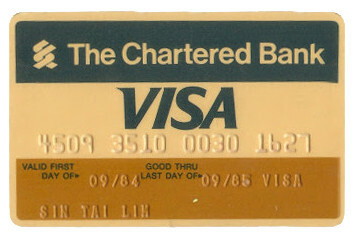 In the 1970s the credit card business was divorced from Bank of America and control was assumed by regionally owned banks across the world. It was re-christened “VISA” and was accompanied by an electronic authorization system that executed transactions in seconds and offered rock-solid security for money transfers: the payment tool of tomorrow had arrived. VisaNet was the name given to the new intricate network of connections around the globe, and it was this cutting-edge technology that would quickly lead to VISA becoming the world’s largest credit card business. In fact, it was this advancement that paved the way for the future of online shopping, giving consumers the ability to purchase a product with the simple click of a button. The ease of this new financial tool would also eventually become the lifeblood of the early days of Internet gambling as well, providing people with a Las Vegas casino and cashier right in the middle of their living room. VISA has been the most widely used method for depositing at USA online casinos over the last two decades because it was accepted by absolutely everyone in the industry from the very beginning. It was quick, easy, and there were rarely any issues. After all, this is the planet’s biggest credit card company, holding more than one-third of the entire world’s revolving debt, and operating in over 200 countries. Unfortunately, these days, things are a little more complicated. For example, often the region where the card was issued from is the most important factor in determining whether or not it will be accepted. Obviously the transactions of cards issued in the United States are going to be scrutinized a lot more than cards issued in say, Luxembourg. Therefore, some deposits get rejected the second the transaction is attempted and the card becomes flagged going forward, resulting in the player immediately having to find a new method. That said, you have to remember that when the government moved to shutdown Internet gambling in the USA back in 2006, the new “Unlawful Internet Gambling Enforcement Act” (UIGEA) targeted the banks processing financial transactions for casinos and not the players spending it. It’s for this reason that it’s entirely possible for a VISA card to be declined somewhere that happily accepts American players. The only way to know for sure is to try to deposit using it – maybe it will work and maybe it won’t. Many places used to pay out gambling winnings directly back on to the VISA card that was used to make the deposit, however, they have all stopped this practice over the last few years out of fear of alerting VISA to what the transactions were actually for. It’s obvious that operators are going to be a lot more concerned with money coming in, than money going out, so they’re just not going to risk getting flagged unnecessarily. The convenience of depositing at a USA online casino with a Visa card comes with a price in the form of fees. Thankfully, some operators will pay for your fees on deposits over a certain amount so always be sure to check their deposit information page to see what their thresholds are. That said, it has become more common for operators to pass on their merchant fee of a few percentage points on to their customers, with places like Bovada sometimes billing as high as 4% of the total transaction amount. Some people get nervous when VISA gambling because credit card information such as account numbers have to be shared with the casinos, but there’s honestly no need to worry. The transaction is not any more riskier than normal purchases made online and your data is totally safe. Every website now uses amazing encryption technology to protect all of their player information so everything you do with them is just as private as doing online banking: you’re fully protected. Bettors in the States have been really helped out over the past few years thanks to VISA prepaid cards and gift cards, which have had an extremely high success rate with many operators. Unfortunately, these types of cards cannot be reloaded with additional funds and they’re only good until the prepaid balance is depleted, and most times you can only make one deposit with it for the full balance available. However, with the emergence of cryptocurrency technology it appears as though both credit and gift cards may one day become a thing of the past since it’s much easier to gamble online with Bitcoin than it is with a physical piece of plastic that charges you high fees. Crypto deposits cut out the banks and the paper trail, and are received instantaneously by the operator. It’s simply an economic revolution – the world’s financial system is going digital.